The garden has come full circle once again, the second time over. 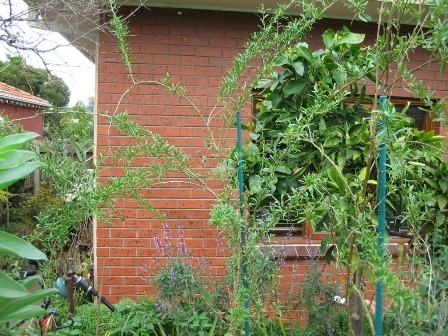 It’s been two years since the garden was first built, and it’s all quite promising! 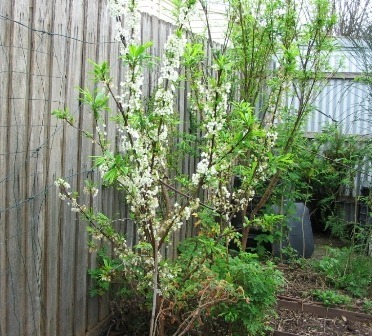 More of the fruit trees are maturing, and I’ve added a whole lot more plants to the garden as I continue to experiment with various different plant species. There were a few surprise harvests. 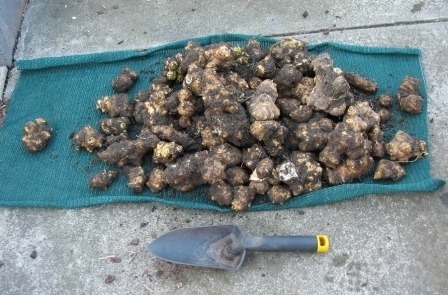 Thinking that my Jerusalem artichokes didn’t make it, I gave up on them, but when I dug up the soil, I managed to harvest 6.54kg of tubers, all this from four walnut sized tubers I bought a few months back! Even after harvesting every bit I could find, I’ve still got plenty of new plants coming up from stray fragments of tuber left behind in the soil. Seriously, these are one of those plants that are hard to get rid of! Here are some picture of what I pulled out of the ground. A huge haul of Jerusalem artichokes, all from four small walnut sized tubers! 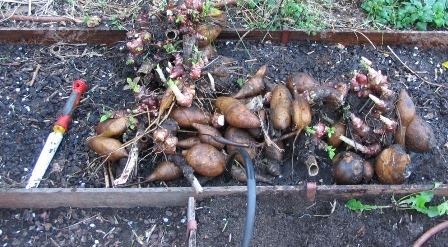 Another productive root crop gave even more impressive harvests, the Yacon yielded close to 15kg of edible long brown tubers, and a stack of the red crowns (with the white pointed shoots that you can see in the photos) to regrow the next years plants from and to divide up for propagation and to share around. The edible tubers were delicious, they can be peeled and eaten raw. They really do have a taste of apple and sugar cane, with a carrot like texture, only smoother. A friend also cooked some up in a stir fry, and prepared this way they were equally delicious. 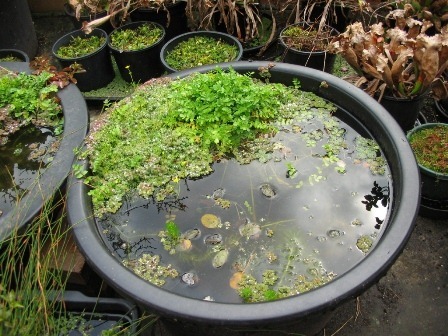 I gave plenty of the crowns away so people could enjoy the pleasure of this wonderful and easy to grow plant. 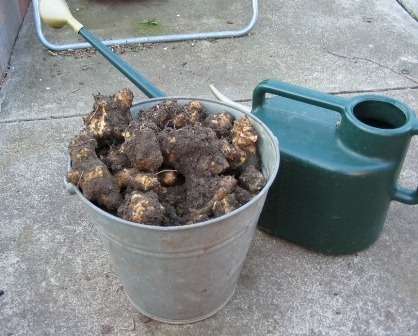 An even bigger harvest of Yacon, nearly 15kg pictured here, all delicious, and all eaten very quickly! With some brief descriptions, I’ll show you a few pictures of what’s happening in the garden in early spring, then we’ll proceed to the yield statistics! 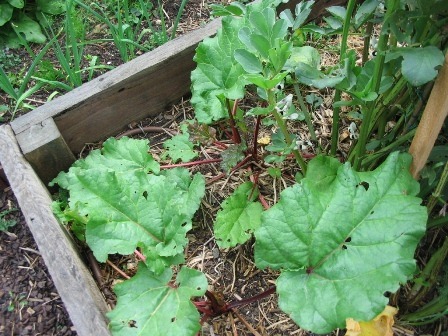 Here’s my first successful attempt at a rhubarb patch, it’s growing well in the rich, organic soil! Two new blueberries planted, pine needle mulch to keep the soil acidic, peppermint scented pelargonium planted between them as ground cover. 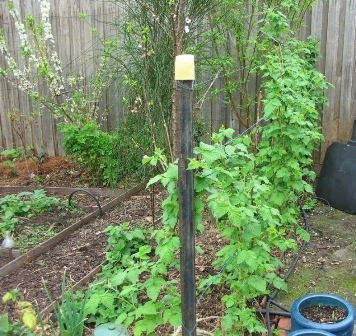 Second grape vine trellis added to garden, aligned north-south lengthwise, growing a large green desert grape here. As the grape vine won’t grow big enough this year, I’ll be running beans and tomatoes up the trellis too. 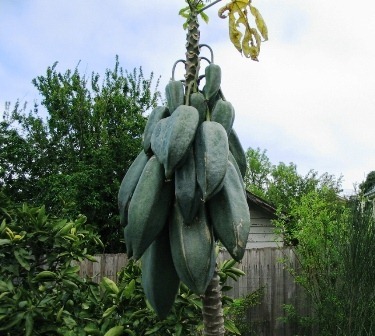 Babaco fruiting in its second year planted in the ground, these fruit are huge, around 25-30cm (10-12”) long! The wild trailing plant with fine leaves snaking its way around here is a Goji berry. It it still growing and will get bigger! West view, with my container potato garden in the foreground. East view of garden, raised sleeper beds and paths can be seen clearly here. You can just notice the irrigation lines coming out of the paths and bending over into the beds. The whole irrigation system is buried underneath the surface. North-west view from opposite side of garden. You can see my irrigation controller and the various irrigation plumbing I’ve installed to water the garden and all the pots. North-west view from centre of garden. 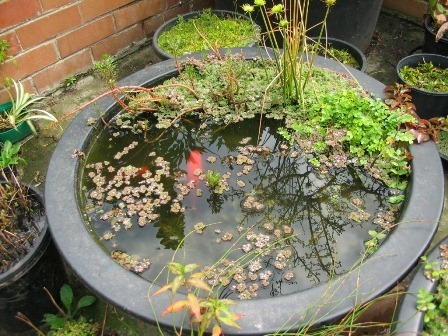 Here’s my original water garden, the plants are starting to emerge again after winter. You can see the two comet goldfish just below the surface. Flowers are important too, biodiversity is the way to go, and it looks pretty too! 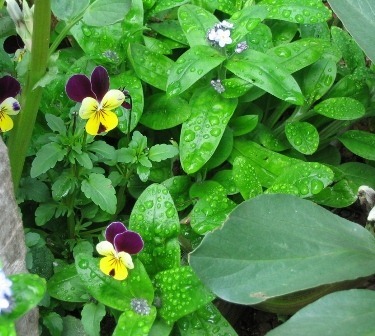 Here are violas and forget-me-nots. 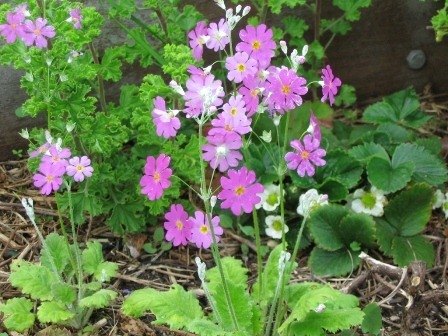 Primulas growing amongst the strawberry patch under the grape vine trellis. 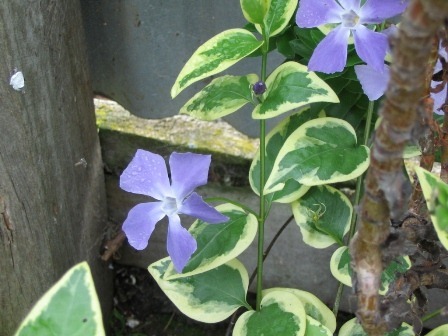 Periwinkles (variegated Vinca major) growing in a damp corner, adding a bit of spring colour. 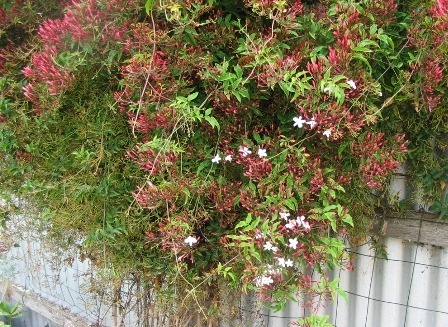 Fragrant jasmine flowering. The sweet perfume scent carries in the wind, it’s wonderful. 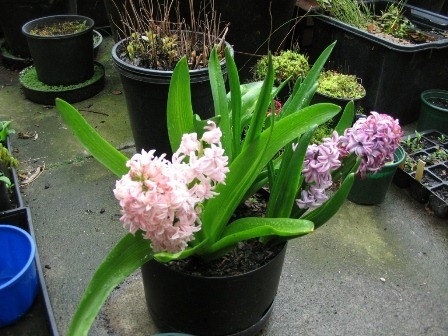 Not to be outdone in fragrance, here are my hyacinth bulbs growing and flowering in a self-watering pot. 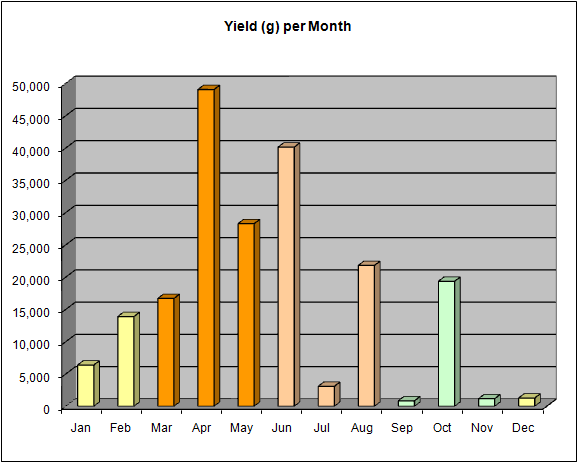 Here are the final figures for the garden yields for the period of Oct 2009 – Oct 2010, the garden’s second year. I can happily say that the annual production for this first year was 202kg, up 71kg from last years 131kg. The total garden bed area is 686 sq. feet (64 sq. metres). The average monthly amount of produce was just over 15kg, up 5kg per month from last years 10kg. The only anomalies are the “low-spots” in July and September, this is what happens when you forget to plant your seasonal annuals! 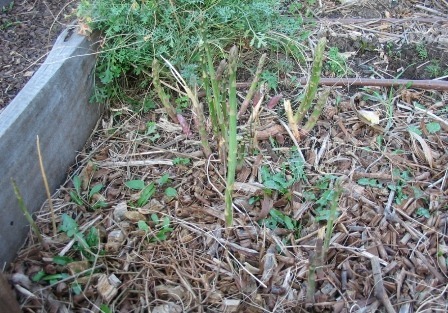 Even with human error, the garden still remains highly productive, and significantly more so than before. Like I mentioned, annuals are the source of most of the work in any garden, hence my preference for perennials. 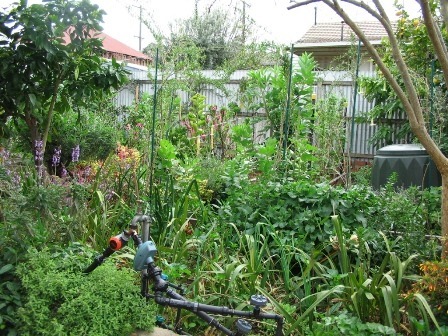 Since my garden is a demonstration Permaculture garden, I run many garden tours, and I’ve had hundreds of people come and visit in the last two years. 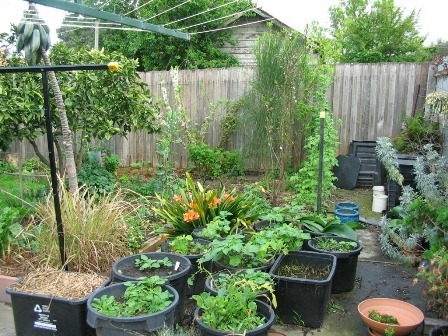 One of the strangest observations I’ve had often is “I can’t see much/any vegetables!” I produce more vegies than most urban gardens, but because I use an over-stacked food forest design, there aren’t neat rows of any vegetables anywhere, and not surprisingly, I don’t have pest problems or crop rotation problems with any vegetables, just the occasional scale on the citrus trees thanks to the ants farming them, putting them there and protecting them! 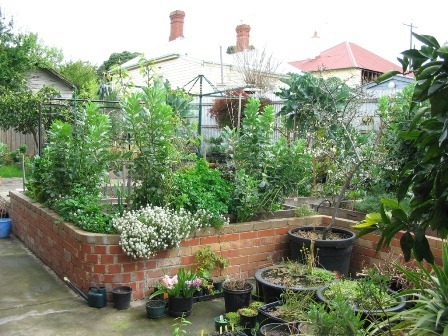 The most amusing comment I’ve had to this website was from a gentleman looking at the pictures and commenting “even though your garden is mainly ornamental…). 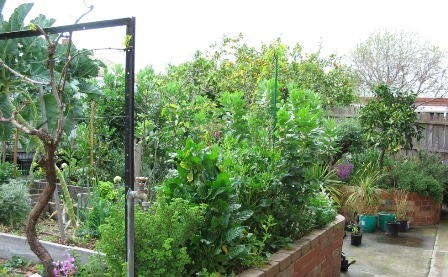 I thanked him for what I saw as a great compliment, he was suggesting that the garden was aesthetically pleasing to look at, wow, how great, it grows that way mainly on its own! I did promptly remind him that it’s really a food garden though! 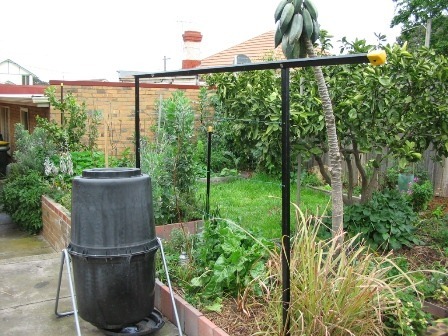 So there you go, it works well, looks great, and produces lots of food. 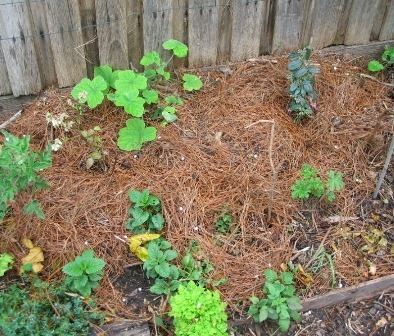 Permaculture proof of concept, you betcha! If we break down the figures by type of produce (fruits, vegetables and berries), we can see the how much productivity we got in each of these categories. This year, fruit production increased by 71%. 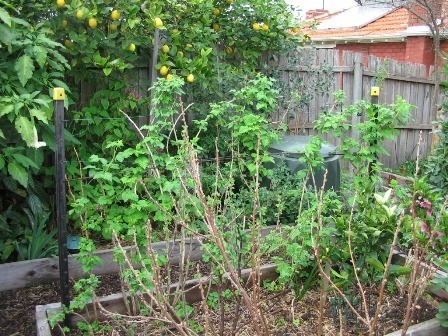 This increase is expected, as the backyard orchard, which is very young, matures enough to start producing fruit. 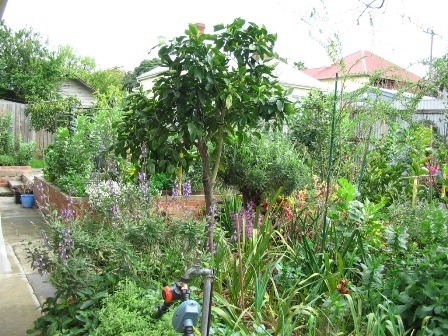 Over 70% of the fruit trees in the garden have yet to bear any fruit, due to their age, 2 years or younger. Over the next three years, all of the trees will be producing, and the expected yields will be significantly higher across all trees as the years progress. The performance of the berries has been outstanding this year, yields have increased by 56%. This year I also added a few more berries in the garden – youngberries, thornless blackberries, loganberries, thornless gooseberries, black currants, red currants and golden currants. With this many additional varieties of berries, it’s going to be berry self-sufficiency. 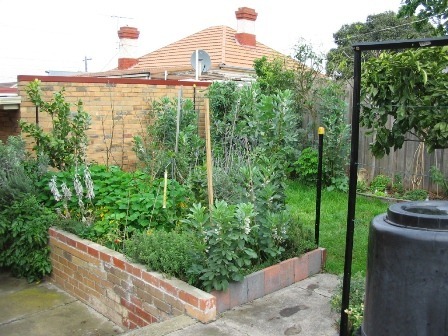 This year I actually got 5kg less vegetables than the year before, as I forgot some of my annual planting, though whichever way you look at it, 70kg of vegetables from a 64 square metre garden is a pretty good! Incidentally, if some of the yields look absurdly low, like 52g of perpetual spinach or 152g of parsley, that’s because that’sall that was harvested, there was kilos of the stuff, but if it wasn’t harvested, or if it ends up being composted or going to seed, it doesn’t get counted. The garden actually produced a heap more leafy greens than the statistics indicate, they just weren’t used, and therefore not part of the harvest figures. So, my 2 year old fledgling garden that is just getting started is producing the equivalent of 12,773kg/acre, in other words, close to 12.77 metric tonnes per acre! I’m looking forward to seeing how high I can get production – remembering it’s all organic, no pesticide other than a rare use of organic neem horticultural soap or white oil, and no fertilizer other than the compost and worm casting liquid, and the rare donation of a small bag of manure that I get when I give people free plants. For the next twelve month’s I’ll just publish the harvest figures month by month, I’ve become quite accustomed to weighing almost everything coming out of the garden over the last two years! 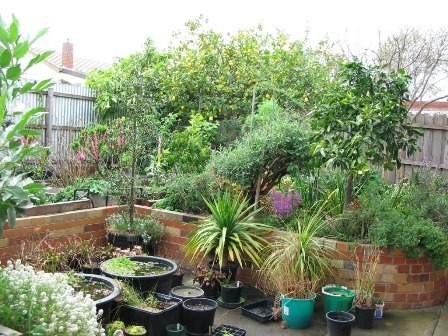 Now I’ve filled this garden, and I have no more space left, I’ve started working on other people’s gardens, and some community garden projects, so I might publish some of those projects too, for it can’t always be about my garden! Wonderful shots of your productive and beautiful garden. I havent thought of recording yields. I am in my first year of fruiting on my young trees and have had a super broad bean crop, lettuce, spinach, lemons, parsley, rhubarb and snow peas and am looking forward to raspberries. It is always a pleasure to see your results. Thanks for sharing. That’s a beautiful garden! Your website has some real substance, it’s very useful and inspirational. I’ve started doing the same myself (I hope!) 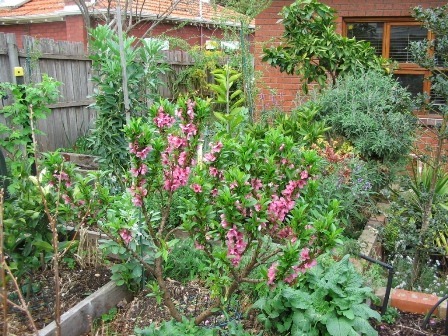 in my garden in ‘inner city’ Ballarat after a year of WWOOFing. After a lot of hard work clearing a very overgrown garden starting last Autumn and just putting in veggies and fruit trees / vines as I went I’m already harvesting about half our veggies I reckon. I like your grape vine trellis too, it’s looks like something I could do and I think I might do the same. Thanks! It great that you are keeping a tally of the produce you harvest. 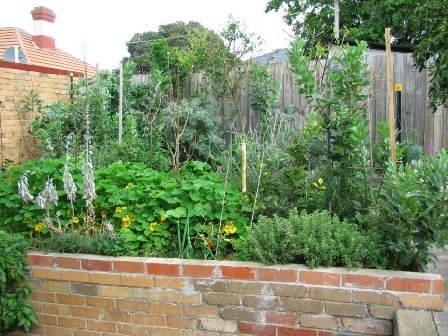 Interesting to see how productive your garden is. I’ve planted a few fruit trees last winter but I’m not sure I am so disciplined to keep a log. Love your stats! It’s amazing how productive this is. I guess the 64 square metres doesn’t include the paths? What size would it be if it did include this extra area, which is still essential area? I only think it would be useful so as to compare it to acres. 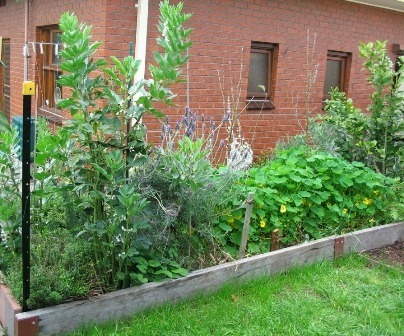 I’m sure you’ve been very efficient in allocating garden bed space in your permaculture design. It’s 83 square metres including the paths, 64 without. 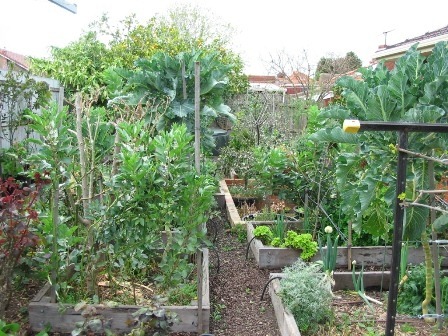 Just found this site and the garden progression was great to watch … i keep a similar ‘journal’ and found my little 12 sq/m plot gave us about 50 kg of veg and 600 eggs from our two chooks … eat the garden! Food forest next?